I decided to make it again – I adore marble cakes – and used a slightly different recipe (same source, though) and a larger pan. Tangerines replaced oranges and went along with the chocolate batter. The cake turned out delicious. Preheat the oven to 180°C/350°F. 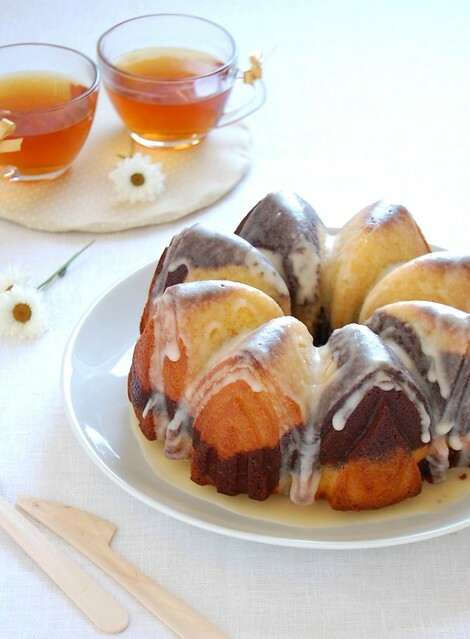 Butter generously a 10-cup capacity Bundt pan. Place the butter, sugar and vanilla in the large bowl of an electric mixer and beat until light and fluffy. Add the eggs, one at a time, beating well after each addition (scrape the sides of the bowl occasionally). Sift the flour, baking powder and salt over the butter mixture and fold through with the milk. Pour half of the batter into another bowl and add the tangerine zest. To the other bowl, add the cocoa, extra milk and sugar and stir to combine. Drop alternate spoonfuls of the two batters into the prepared pan, the swirl lightly with a butter knife to give the cake a marbled effect. Bake for 50-55 minutes or until risen and golden and a skewer inserted in the center of the cake comes out clean. Cool in the pan on a wire rack for 20 minutes then carefully unmold onto a wire rack (if using a silicone pan follow the manufacturer’s instructions). Cool completely. Make the icing: sift the icing sugar into a small bowl. Add the tangerine juice and mix until spreadable consistency. Spread over the cake. I'm so happy you give it another go! I've told you, it's a great movie. Gorgeous cake! I love the combination of chocolate and orange. Delicia! And I love the pan shape - beautiful! I wish I was patient and persistent, especially when it comes to baking. Lol! Oh this looks so beautiful, I just want to eat it now! you are too good to give it another go. Once a recipe doesn't work for me and I followed each step carefully i throw my hands up in the air and try for an entire week to forget it. Good on you for soldiering on. Tangerine, chocolate and vanilla sound like a delicious match. Looks lovely! and i LOVE that mold... I must try it since we are in full tangerine season! Glad you didn't give up. I admire people who persevere - I almost never do. This looks perfect. Вау! Какая же красота!!! А как должно быть вкусно!!! Made this on sunday and we loved it. My mum said it was her fav cake I've made. Thanks so much!! That is excellent news, Antonietta! Thank YOU for letting me know how the cake turned out! Delicious cake! Made it yesterday! Wonderful receipt Patricia! Congratulations!